04/03/19 - Children's University addressing "Smart Brigdes"
How do smart bridges function? As part of the lecture, "young scientists" from the audience have assisted in experiments. Further information on the Children's University can be found here. On April 01, 2019, Daniel Luckey joins the team of the Chair of Computing in Civil Engineering. Mr. Luckey supports the chair in teaching, in particular in the degree programs "civil engineering" and "management", and he is involved in the research areas "Explainable Artificial Intelligence" and "3D Concrete Printing". Next semester, the Chair of Computing in Civil Engineering again offers the course"Scientific Working in Computational Engineering", to be held in English language (6 CP, elective module/elective compulsory module/project). The course addresses master students (of all faculties) as well as PhD students. In this course, important concepts and methods of scientific working in the context of practical applications of computing in civil engineering will be taught. Since scientific writing is of particular importance in this course, a scientific paper will be developed. The topic of this semester is the implementation of smart sensor systems. The first meeting will be held on April 12 at 10:00 am in room 520 (Coudraystr. 7), in which date and time of further meetings will be arranged. Enrollment is limited. In January 2019, the "Smart Monitoring" student contest has celebrated its 5th anniversary. In this contest, annually hosted by the Chair of Computing in Civil Engineering, interdisciplinary student groups have developed intelligent sensor systems that "compete" against each other in laboratory experiments, after being installed on a laboratory test structure. As can be seen from the pictures below, this year different test structures have been used to simulate both bridges and buildings. The students have implemented artificial intelligence approaches into the sensor systems, enabling the devices to autonomously analyze the conditions of the test structures. Also, mass dampers and tuned liquid column dampers have been developed and tested in the laboratory. This year, the first prize goes to Gledson Rodrigo Tondo, Sara Daniela Torres Achicanoy, Steffany Michell Orellana Enriquez, Tamrat Tesfaye Demissie, and Tewodros Gashaw Fetene (photo, LTR). In a collaborative research project, the Chair of Computing in Civil Engineering and the Division of Structureas at Aristotle University of Thessaloniki (Professor Manolis) aims to study the dynamic behavior of slender structures using structural health monitoring data and explainable artificial intelligence (XAI). The XAI approach, as compared to many “traditional” artificial intelligence approaches, achieves models that are more transparent and explainable to engineers in practice, while maintaining high learning performance and prediction accuracy. The project is financially supported by the German Research Foundation from 2019 to 2020. 01/11/19 - Examination "Fundamentals of structural health monitoring (SHM) and intelligent structural systems"
February 14, 2019, from 10:00 am to 6:10 pm in Coudraystraße 7, room 505. The schedule of the individual appointments is announced on Moodle. 12/17/18 - Presentation and exam "Scientific Working in Computational Engineering"
This semester, a semantic model of a structural health monitoring (SHM) and control system has been developed and integrated into the methods of building information modeling (BIM) using the Industry Foundation Classes (IFC) standard. Everyone interested is invited to join the presentation at 2:00 pm (duration with Q&A approximately 1h). The oral examinations will take place after the presentation. The schedule of the individual oral examinations will be announced on Moodle. full-time position. Applications should be emailed to franziska.fritsch[at]uni-weimar.de. Review of applications will begin on January 31, 2019, and will continue until the position is filled. Further information (in German) can be found here. Theresa Fitz has received the Erhard Hampe Award for her excellent master thesis entitled „Analysis of metamodeling approaches for describing monitoring-related information“, supervised by Professor Smarsly and Mr. Theiler. The Erhard Hampe Award is bestowed annually by the Association of the Friends of the Faculty of Civil Engineering (VFBB) in recognition of outstanding scientific achievements. The Chair of Computing in Civil Engineering this semester offers the course "Scientific Working in Computational Engineering", to be held in English language (6 CP, elective module/elective compulsory module/project). The course addresses master students (of all faculties) as well as PhD students. In this course, important concepts and methods of scientific working in the context of practical applications of computing in civil engineering will be taught. Since scientific writing is of particular importance in this course, a scientific paper will be developed. The first meeting will be held on October 19 at 10:00 am in room 520 (Coudraystr. 7), in which date and time of further meetings will be arranged. Enrollment is limited. The conference "30th Forum Bauinformatik" has successfully ended. The conference was characterized by outstanding presentations from research and practice as well as exciting discussions in pleasant atmosphere. The Chair of Computing in Civil Engineering would like to thank all participants, without whom the great success would not have been possible. Impressions from the conference are provided in the photo archive. Faculty and staff of Bauhaus University Weimar is kindly invited to attend the conference sessions free of charge. For participating in the whole program, which includes dinner, city tours and further events, regular registrations are open to everyone until September 7, 2018. The Chair of Computing in Civil Engineering has again offered a project within the Bauhaus Summer School. The goal of this project has been to design, to implement, and to validate a wireless structural health monitoring and control system, capable of autonomously adapting the parameters of control devices used to modify the structural behavior. Structural control has been achieved via a tuned liquid column damper. DFG project "BIM-based structural health monitoring"
A list of research projects conducted at the Chair of Computing in Civil Engineering can be found here. 05/09/18 - Third programming contest "Structural health monitoring of prestressed concrete bridges"
The Chair of Computing in Civil Engineering hosts, for the third time, the "2018 IiB Programming Contest" to challenge student programmers. Students, who have completed the assignment of the "Engineering Informatics" course in summer term 2018, are entitled to participate. Participating students not only compete against each other for fame and glory; instead, the top teams will receive vouchers or material prizes. The deadline ends on August 3, 2018. Further Information can be found here (only available in German). Final meeting of the course in the last semester (see news entry below). This semester, the Chair of Computing in Civil Engineering again offers the course "Scientific Working in Computational Engineering", to be held in English language (6 CP, elective module/elective compulsory module/project). The course addresses master students (of all faculties) as well as PhD students. In this course, important concepts and methods of scientific working in the context of practical applications of computing in civil engineering will be taught. Since scientific writing is of particular importance in this course, a scientific paper will be developed. Last semesters' topics have been, for example, building information modeling (BIM), facility management, unmanned aerial vehicles, and smart sensors for structural health monitoring (SHM). This semester, web-based structural health monitoring using the Raspberry Pi platform will be implemented. The first meeting will be held on April 13 at 10:00 am in room 520 (Coudraystr. 7), in which date and time of further meetings will be arranged. Due to limited enrollment, please contact the instructor Professor Smarsly if you would like to participate. On May 15, 2018, the Chair of Computing in Civil Engineering welcomes Professor Konstantin Y. Lossev (Moscow State University of Civil Engineering). Professor Lossev will deliver a guest lecture within the seminar series “Computing in Civil Engineering”, entitled "Towards product life-cycle management in the Russian construction industry". The guest lecture takes place at 1:00pm in room 505, Coudraystr. 7. Ms. Constanze Matthus, who has written her M.Sc. thesis at the Chair of Computing Civil Engineering, has been awarded by the German Federal Ministry for Economic Affairs and Energy (BMWi) with the 1st prize within the national "Built on IT" competition. The prize has been bestowed for her M.Sc. thesis, supervised by Professor Smarsly and by Michael Theiler, which is entitled “BIM-based design of SHM-related processes and algorithms”. The award ceremony has taken place on February 21, 2018, at the international "bautec" trade fair in Berlin, and it has been organized, as every year, by the RKW Competency Center. Students of the class “Scientific Working in Computational Engineering”, offered by the Chair of Computing in Civil Engineering, have developed a wireless monitoring system for sensor-based Internet-enabled facility management. Due to the modular concept, the system can be used as an Internet-enabled meat thermometer. Upon final presentation and examination of the class, the Internet-enabled meat thermometer has been validated within a barbecue evening on February 12, 2018. Impressions of the barbecue evening can be found below. In January 2018, the "Smart Monitoring" student contest, hosted by the Chair of Computing in Civil Engineering, has celebrated its 5th anniversary. 26 students of different degree programs have participated in 6 interdisciplinary student groups. Intelligent structural health monitoring systems have been implemented and installed on a test structure to "compete" against each other in laboratory tests. Due to several student requests, structural control systems, in addition to the intelligent structural health monitoring systems, have been implemented this year. Not one, but two teams have won this year. The prize has been divided between the team of Behnam Mehrkian Jorshari, Cristina Baby, Elnaz Mousazadeh, and Saboor Karimi and the team of Carlos Cardenas Estrada, Luis Federico Navarro Vilchez, Patricia Peralta Abadia, and Rodrigo Olivares, who have received their prizes on February 6, 2018. On January 15, 2018, the research project „Semi-probabilistic, sensor-based design concepts for intelligent structural systems”, funded by the German Research Foundation (DFG) from 2018 to 2021, has started. The Chair of Computing in Civil Engineering welcomes Dr. Legatiuk and Mr. Ibanez, who will work in the project as a postdoc and as a Ph.D. student, respectively. Both individuals will conduct basic research in the field of mathematical modeling and semantic description of sensor-based building information. 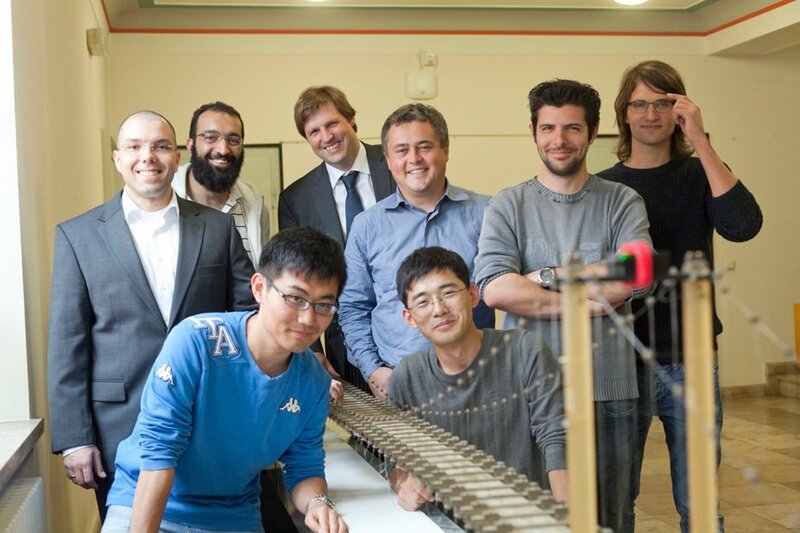 Co-PI of this project is Professor Matthias Kraus, director of the Chair of Steel Construction. Mahsa Mirboland has joined the Chair of Computing in Civil Engineering on January 1, 2018, as a PhD student and researcher in the research group "Digital roads”, which is funded by the European Union through the European Social Funds (ESF) from 2018 to 2020. In the research group, Ms. Mirboland is responsible for modeling and simulation of intelligent sensor-based transport infrastructure. Besides the Chair of Computing in Civil Engineering, the Chair of Steel Construction and the Chair of Transport System Planning are involved, the latter coordinating the research group. Together with President Speitkamp and other representatives of Bauhaus University Weimar (BUW), a delegation of the Chair of Computing in Civil Engineering has visited Moscow State University of Civil Engineering (MGSU) from October 4 to October 7, 2017, to celebrate the 50th anniversary of the bilateral cooperation between BUW and MGSU. In an interview, Professor Smarsly has emphasized the successful joint activities of both universities in teaching and research, such as collaborative courses with student exchange, guest lectureships of Weimar lecturers at MGSU, and joint research activities of the Chair of Computing in Civil Engineering with the Russian partners in the fields of structural health monitoring, facility management, and building information modeling. to be filled by January 15, 2018. The position is funded by the German Research Foundation (DFG). The position, limited to 3 years, is a full-time position to conduct research in the field of sensor-based design concepts for intelligent structural systems. Project information can be found here. More information about the position and about the application procedure (in German) can be found at the university website or as a PDF file. The preferred project language is English. On September 01, 2017, Maria Steiner joins the team of the Chair of Computing in Civil Engineering. Ms. Steiner supports the chair in teaching, primarily in the degree programs "civil engineering" and "management", and she is conducting research in fault-tolerant sensor networks for wireless structural health monitoring. The Chair of Computing in Civil Engineering welcomes Dr. Heinrich Söbke. Starting on September 1, 2017, Dr. Söbke works as a postdoc in the research project "ILMA - Integral lifecycle management for wastewater treatment". In the upcoming winter semester, the Chair of Computing in Civil Engineering again offers the course "Scientific Working in Computational Engineering", to be held in English language (6 CP, elective course/project). In this course, students define a scientific topic to be investigated. Last semesters' topics have been, among others, Building Information Modeling (BIM), unmanned aerial vehicles, smart sensors for structural health monitoring (SHM), or model quality assessment in structural engineering. The first meeting will be on October 13, at 10am in room 520 (Coudraystr. 7), in which date and time of further meetings will be arranged. Limited enrollment. Please contact the instructor Professor Smarsly if you would like to participate. 07/07/17 - Second programming contest "User-friendly heat flow calculations"
The Chair of Computing in Civil Engineering hosts, for the second time, the "2017 IiB Programming Contest" to challenge student programmers. Students, who have completed the assignment of the "Engineering Informatics" course in summer term 2017, are entitled to participate. Participating students not only compete against each other for fame and glory; instead, the top teams will receive Amazon vouchers and material prizes. The deadline ends on August 4, 2017. Further Information can be found here (only available in German). The guest lecture takes place at 9:15am in room lecture hall 6, Coudraystr. 9 A.
to be filled by July 1, 2017. The position is initially limited to 3 years but can be extended. It is part-time position (20 hrs/week) with the opportunity to conduct research towards a PhD or habilitation thesis, under supervision of Professor Smarsly. More information (in German) can be found at the university website or as a PDF file. The Chair of Computing in Civil Engineering this semester again offers the course "Scientific Working in Computational Engineering", to be held in English language (6 CP, elective course/project). In this course, students define a scientific topic to be investigated. Last semesters' topics have been, for example, Building Information Modeling (BIM), unmanned aerial vehicles, smart sensors for structural health monitoring (SHM), or model quality assessment in structural engineering. The first meeting will be on April 7, at 13:30 in room 520 (Coudraystr. 7), in which date and time of further meetings will be arranged. Limited enrollment. Please contact the instructor Professor Smarsly if you would like to participate. Michael Theiler will join the Chair of Computing in Civil Engineering as a PhD student and researcher in the project "Metaization concept for structural health monitoring", funded by the German Research Foundation (DFG) from 2017 to 2020. Mr. Theiler will conduct basic research in the field of information modeling in structural engineering. The winners of the 4th annual "Smart Monitoring" contest. In the middle: Mrs. Tartaglione, Mr. Karami, Mr. Lizarazu Garvizu und Mr. Rahat. The winners of the 4th annual "Smart Monitoring" contest are four students of the "Natural Hazards and Risks in Structural Engineering (NHRE)" master's degree program, who have received their prizes (Amazon vouchers) on February 15, 2017. In the student contest, intelligent structural health monitoring systems, consisting of wireless sensor nodes, have been developed by different student teams that competed against each other in laboratory tests. The structural health monitoring system developed by Mrs. Tartaglione, Mr. Karami, Mr. Lizarazu Garvizu and Mr. Rahat has won the contest, because a very ambitious field of research, the synchronization in wireless sensor networks, has been investigated and implemented into a reliable structural health monitoring system. On January 25, 2017, the Chair of Computing in Civil Engineering, as every year, has hosted the "Smart Monitoring” student contest, in which about 20 students have participated. Intelligent structural health monitoring systems have been implemented and installed on a test structure, provided by the Institute of Structural Mechanics (Dr. Zabel), in order to "compete" against each other in laboratory tests. Based on wireless sensing technologies, the intelligent monitoring systems have been designed to autonomously collect and analyze structural data. The projects are part of different courses covering structural health monitoring ( , ,  ) that are offered by the Chair of Computing in Civil Engineering since winter term 2013/2014. The winning team will be notified on February 15, 2017. 11/24/2016 - PhD student receives innovation prize "Sauerland initiativ 2016"
The Chair of Computing in Civil Engineering develops methods and concepts for cost-efficient expansion of the broadband infrastructure. Jens Wiggenbrock, external PhD student at the chair and co-worker at South Westphalia University of Applied Sciences, has been honored with the innovation prize "Sauerland initiativ 2016" on November 24, 2016, bestowed by companies in the Sauerland region. The 10 000 EUR prize, 8000 EUR of which awarded to Mr. Wiggenbrock, is bestowed for the software for planning and implementing the expansion of broadband networks, which is developed by Mr. Wiggenbrock at the Chair of Computing in Civil Engineering within his PhD project. This semester, the Chair of Computing in Civil Engineering again offers the course "Scientific Working in Computational Engineering" to be held in English language (6 CP, elective course/project). In this course, students define a scientific topic to be investigated. Last semesters' topics have been, for example, unmanned aerial vehicles, smart sensors for structural health monitoring, or model quality assessing the condition of civil engineering structure. The first meeting will be on Thursday, October 14, at 13:30 in room 520 (Coudraystr. 7), in which date and time of further meetings will be arranged. Limited enrollment. If you would like to participate, please contact the instructor Prof. Smarsly. From September 12, 2016, to September 16, 2016, the Sixth German-Russian Week of the Young Researcher has been taken place at Moscow State University of Civil Engineering, with participation of the Chair of Computing in Civil Engineering. On June 24, Professor Große (TU Munich) will visit Bauhaus University on invitation of the Chair of Computing in Civil Engineering to give a mini workshop entitled "Non-destructive inspection and monitoring techniques for wind turbines and bridges - integrated design" within the scope of the DFG research training group 1462. Professor Große holds the Chair of Non-Destructive Testing and is Director of the Centre for Building Materials at Technical University Munich. His research interests include the application and development of non-destructive testing methods as well as structural health monitoring. The workshop will take place at 10am at Berkaer Str. 9 (seminar room). Seminar series "Computing in Civil Engineering". The Chair of Computing in Civil Engineering hosts, for the first time, the "2016 IiB Programming Contest" to challenge student programmers. Students, who have completed the assignment of the "Civil Engineering" course in summer term 2016, are entitled to participate. Participating students not only compete against each other for fame and glory; instead, the top teams will receive Amazon vouchers and material prizes. The deadline ends on August 5, 2016. Further Information can be found here (only available in German). Dr. Heiko Kirschke, member of the Chair of Computing in Civil Engineering, has been awarded an honorary doctorate degree from Moscow State University of Civil Engineering (MGSU). The honorary degree has been awarded in recognition of Dr. Kirschke's outstanding achievements in the bilateral cooperation between Weimar and Moscow, in which he is involved since many years. Dr. Kirschke's achievements have been acknowledged in a laudatory speech of Professor Dr. Andrej Volkov, president of MGSU, on May 24, 2016. Further information (only in German) can be found here. The Chair of Computing in Civil Engineering again offers the course "Scientific Working in Computational Engineering" to be held in English language (6 CP, elective course/project). In this course, we will work on a scientific project. The subject will largely be defined by the students themselves. Examples of past projects include unmanned aerial vehicles and smart sensors for structural health monitoring. The first meeting will be on Thursday, April 7, at 13:30 in room 520 (Coudraystr. 7), in which date and time of further meetings will be arranged. Limited enrollment. If you would like to participate, please contact the instructor Prof. Smarsly. Prize winner Alric Frühauf, B.Sc., and Katrin Jahr, M.Sc. Two graduates, who have written their theses at the Chair of Computing Civil Engineering, have been awarded by the German Federal Ministry for Economic Affairs and Energy (BMWi): Within the national “Built on IT” competition, which is annually bestowed by the BMWi and distinguished partners from German construction industry, Mr. Alric Frühauf, B.Sc., is awarded the 2nd prize and Mrs. Katrin Jahr, M.Sc., is awarded the 3rd prize in the category “Civil Engineering”. The awards have been presented on February 17, 2016, by the Parliamentary State Secretary at the Federal Ministry for Economic Affairs and Energy, Brigitte Zypries, in a ceremony taking place within the international “bautec” trade fair in Berlin (Press release). Posters can be found through the following links, which provide more detailed information (in German) about the B.Sc. thesis by Mr. Frühauf, supervised by Professor Smarsly and Professor Morgenthal (Chair of Modeling and Simulation - Construction) as well as the M.Sc. thesis by Mrs. Jahr, supervised by Professor Smarsly and Mr. Kosmas Dragos. Mr. Alric Frühauf has received a special prize, bestowed by Ed. Züblin AG, for his B.Sc. thesis written at the Chair of Computing of Civil Engineering. The special prize "New practical IT solutions from the industry for the industry" is awarded within the national "Built on IT" competition. Mr. Frühauf is honored for his work on BIM-based calculation of flight paths. Building information models, as known in the construction industry, are used to automatically calculate flight paths for unmanned aerial vehicles in order to facilitate efficient visual inspections of buildings. The thesis was jointly supervised by Professor Smarsly and Professor Morgenthal (Chair of Modeling and Simulation - Construction) at Bauhaus University Weimar. The award ceremony has been on February 17, 2016, at the international "bautec" trade fair in Berlin (Newspaper article, in German: TA 19.02.2016). On February 3, 2016, the annual "Smart Monitoring" student contest, hosted by the Chair of Computing in Civil Engineering, took place the third time. Interdisciplinary student groups of different degree programs have participated. Intelligent structural health monitoring systems have been implemented and installed on a test structure in order to "compete" against each other in laboratory tests. Based on wireless sensing technologies, the intelligent monitoring systems have been designed to autonomously collect and analyze structural data. The projects are part of the courses covering structural health monitoring   that are offered by the Chair of Computing in Civil Engineering since winter term 2013/2014. The winning team will be notified on February 17, 2016. The Chair of Computing in Civil Engineering again offers the course "Scientific Working in Computational Engineering" for master students to be held in English language (6 CP, elective course/Project). In this course, we will work on a scientific project. The project is largely be defined by the students themselves. Examples of past projects include unmanned aerial vehicles and smart sensors for structural health monitoring. The first meeting will be on Friday, October 16, at 13:30 in room 520 (Coudraystr. 7), in which date and time of further meetings will be arranged. Limited enrollment. If you would like to participate, please contact the instructor Prof. Smarsly. 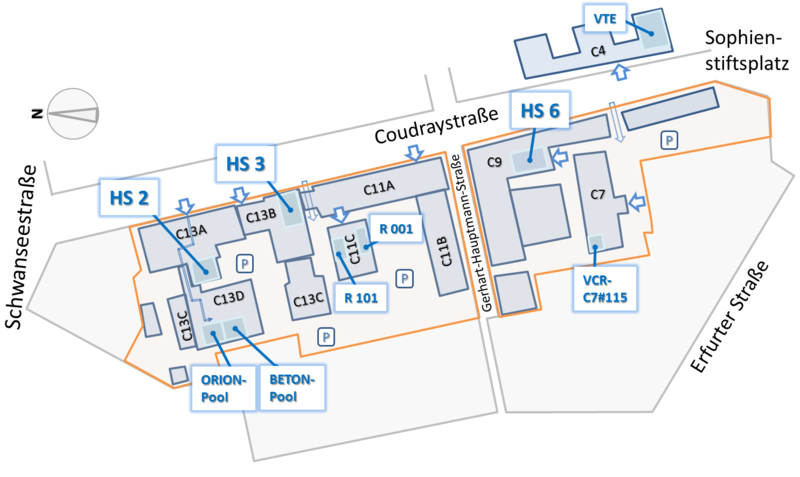 The first lectures on "Structural health monitoring" and "Fundamentals of SHM and intelligent structural systems" will take place for both courses at 9:15am, Coudraystraße 13 D - Orion Pool. Please note: Enrollment must be done online. Information on how to enroll will be provided in the first lecture (it is not possible to enroll earlier). Any further information will be provided in the first lecture (e.g. concerning the enrollment, the project work, the exercises, and the lectures). This year, the best paper award of the "Forum Bauinformatik 2015" goes to the Chair of Computing in Civil Engineering for the contribution entitled "An analytical redundancy approach towards decentralized autonomous fault detection in wireless structural health monitoring", which investigates new strategies for reliable structural health monitoring. The paper, co-authored by Katrin Jahr, Kosmas Dragos and Eike Tauscher, is online available for download. The full publication list of the Chair of Computing in Civil Engineering can be found here. The Chair of Computing in Civil Engineering participates again in the annual German conference on computing in civil engineering, the "Forum Bauinformatik", held in Aachen, Germany. The delegates are Dr. Tauscher, Dr. Kirschke as well as Katrin Jahr, presenting the paper "An analytical redundancy approach towards decentralized autonomous fault detection in wireless structural health monitoring", Kosmas Dragos, presenting the paper "Embedded models in wireless sensor nodes for decentralized condition assessment of civil engineering structures" and Jens Wiggenbrock, presenting the paper "A generic framework supporting distributed computing in engineering applications". Professor Irina Stipanovic Oslakovic and Professor Timo Hartmann will visit Bauhaus University on invitation of the Chair of Computing in Civil Engineering. The researchers from the University of Twente (The Netherlands) will give guest lectures on the impact of climate change on transport infrastructure and on big data issues. The lectures will take place in lecture hall 6 (Coudraystr. 9A) on August 21, 2015, at 11:00am and at 1:30pm as part of the Bauhaus Summer School. Everyone is cordially invited to attend the lectures. This year, the Chair of Computing in Civil Engineering will again be actively involved in the Bauhaus Summer School. In the project entitled "Implementation and Validation of Wireless Structural Health Monitoring Systems", students will implement intelligent sensor networks for automated monitoring of engineering structures, which they will validate in lab tests. Further project information can be found here. The Chair of Computing in Civil Engineering participates in the "summaery2015", the annual exhibition of Bauhaus University Weimar, with a poster (in German) that illustrates our project "Geometric Modeling and Technical Representations" as a part of the strategic partnership with Moscow State University of Civil Engineering (MGSU). Several journals have reported on the BIM teaching contents defined by GACCE (AUTOCAD Magazin, Virtual Reality Magazin, Baulinks Magazin etc.). Also, BuildingSMART, the organization that develops specifications for Building Information Modeling has informed about the GACCE definitions in a press release. Cost-efficient broadband infrastructure improvement: Automated generation of a fiber access network. The weekly computer magazine "Computerwoche" reports on the collaborative research project of the Chair of Computing in Civil Engineering and the South Westphalia University of Applied Sciences, in which methods and concepts are investigated to cost-efficiently improve Germany's broadband infrastructure. Further information are available at the project website. Within the strategic partnership, seven students from the Faculty of Civil Engineering, who are participating in the course "Geometric Modeling and Technical Representations" supervised by Dr. Kirschke, have visited Moscow State University of Civil Engineering (MGSU). At MGSU, the students have defended their projects. Key topics of the projects were related to geometric modeling and building information modeling (BIM). Promoting interdisciplinary cooperation across national borders, the students have also successfully participated in the International Scientific Conference of Students and Young Researchers to present their work to the international scientific community. During the conference, the students also took the opportunity to visit the construction site of the athletics arena of MGSU. 23.03.2015 - Einführungsveranstaltung "Scientific Working in Computational Engineering"
Das erste Treffen zur englischsprachigen Lehrveranstaltung "Scientific Working in Computational Engineering" findet am 10.04. um 13:30 Uhr in Raum 520 statt (Coudraystr. 7). Die weiteren Termine werden in der ersten Veranstaltung festgelegt. Die Teilnehmeranzahl ist begrenzt. On February 4, 2015, the Chair of Computing in Civil Engineering has hosted the "2015 Smart Monitoring" student contest. About 30 students in seven interdisciplinary groups of different degree programs have participated. The groups have implemented intelligent structural health monitoring systems, which have been installed on a test structure in order to compete against each other in laboratory tests. Based on wireless sensing technologies, the intelligent monitoring systems have been designed to autonomously collect and analyze structural data. The projects are part of the courses covering structural health monitoring that are offered by the Chair of Computing in Civil Engineering since winter term 2013/2014. The notification of the winning teams as well as the prize giving ceremony will be held on February 17, 2015. 04.02.2015 - Präsentationen und mdl. Prüfungen "Anleitung zu wissenschaftlichem Arbeiten"
Die Präsentationen und die mündlichen Prüfungen im Fach "Anleitung zu wissenschaftlichem Arbeiten" finden statt am 20.02.2015 in der Coudraystr. 7, Raum 520. Details werden über die E-Learning-Plattform "Metacoon" bekannt gegeben. The German Association for Post, Telecommunications and Information Technology, together with the Federal Ministry for Economic Affairs and Energy and the United Nations Human Settlements Program (UN-HABITAT), has bestowed the "Future Communication Award" to Jens Wiggenbrock, PhD student at the Chair of Computing in Civil Engineering, for his research on "Future Networks". The Chair of Computing in Civil Engineering fosters the development of methods for preliminary planning of infrastructure projects, which is an important contribution to the efficient expansion of fiber optic networks into companies and households. Within the strategic partnership, delegates of the chairs of Computing of Civil Engineering as well as Construction Engineering and Management are visiting the Moscow State University of Civil Engineering (MGSU). Main goals are to foster the partnership in a number of workshops and to attend the International Scientific Conference at MGSU, which is supported by the Ministry of Education and Science of the Russian Federation and other institutions. The Chair of Computing in Civil Engineering is represented with scientific talks on "Fault diagnosis of wireless structural health monitoring systems" (Professor Smarsly) as well as "BIM-based simulation using IFC elements and sensor data" (Dr. Kirschke). 10/15/14 - First class on "Scientific Working"
The first class on "Introduction to Scientific Working", to be held in German, will take place at 1:30pm, Coudraystraße 13 D - Orion Pool. Please note: Limited enrollment. A requirement is to conduct a study in the field of "Civil Engineering Informatics". Dr. Kirschke has received the Gold Medal of the Moscow State University of Civil Engineering (MGSU) for his outstanding achievements in research and teaching. This year the annual German conference on computing in civil engineering - "Forum Bauinformatik" - takes place in Darmstadt. The Chair of Computing in Civil Engineering is represented by Prof. Smarsly and Dr. Tauscher as well as Jens Wiggenbrock with a paper entitled "Classification of OpenStreetMap Data according to the AAA-Model" and Veronika Hartmann, who will present a paper on "Model- and knowledge-based construction scheduling". The participants after the lab tests. The Chair of Computing in Civil Engineering has actively participated in this year's Bauhaus Summer School. In the project entitled "Implementation and Validation of Wireless Structural Health Monitoring Systems", students have implemented an intelligent sensor network for monitoring engineering structures, which they have validated in lab tests. Professor Timo Hartmann, director of the VISICO Center at University of Twente, visits Bauhaus University on invitation of the Chair of Computing in Civil Engineering and will give a guest lecture entitled "Fusing Big City Data with Civil Engineering Design Ideas". The guest lecture takes place on August 26, 2014 at 11:00am in lecture hall 6 (Coudraystr. 9A) as part of the Bauhaus Summer School. 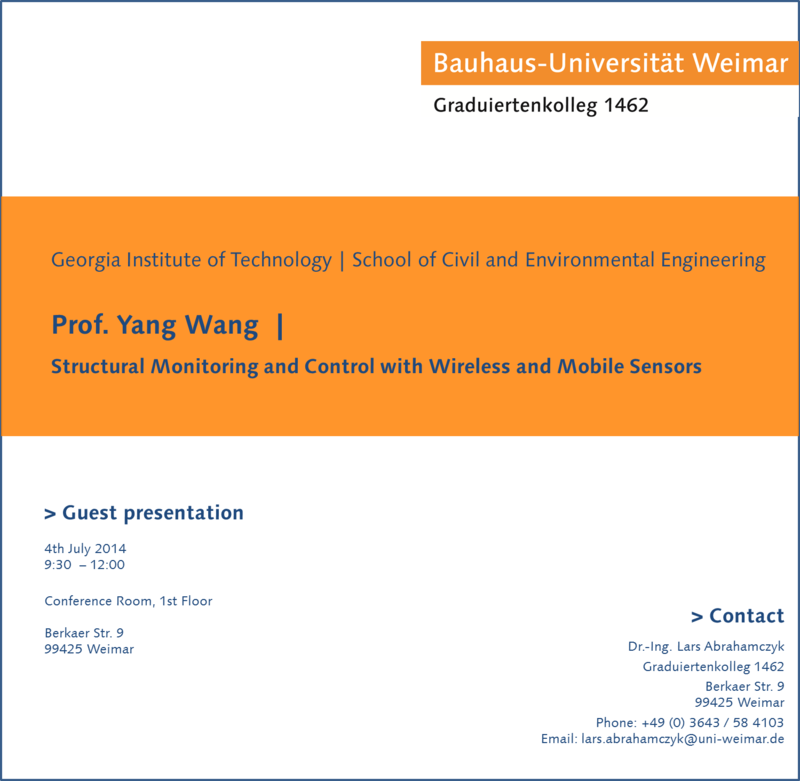 Professor Yang Wang (Georgia Institute of Technology) follows an invitation of the Chair of Computing in Civil Engineering and, within a workshop at Weimar's "Research Training Group 1462", he will give a lecture on "Structural Monitoring and Control with Wireless and Mobile Sensors". Time and location: 07/04/2014, 9:30am - 12.00pm, conference room of the Research Training Group 1462, Berkaer Str. 9. From April 21 to April 25, Dr. Kirschke has participated in the Third International Young Scientists Forum on invitation of the president of the Astrachan Civil Engineering Institute. Dr. Kirschke has given a talk at the opening ceremony and an invited lectures on construction planning and building information modeling (BIM) during the conference. Also, he was invited in a talk show, hosted by the president of the Astrachan Civil Engineering Institute. Pictures can be found here. The test database of the Chair of Computing in Civil Engineering is online available at http://www.ingenieurinformatik.net. The test database is an additional teaching element, which has been designed to support students in gaining knowledge and to improve their practical skills in the field of database systems. Please note that the test database is accessible only from within the Bauhaus University Network. A PhD student position in the field of computing in civil engineering is available within the Research Training Group 1462 (supervisor: Prof. Smarsly). Topic: Sensor-based, hybrid partial models for decentralized condition assessment of civil engineering structures. Starting date: June 1, 2014. Further information can found in the announcement. The Bauhaus-Journal Online has published a report on the "2014 Smart Monitoring" student competition, which has been organized and hosted by the Chair of Computing in Engineering. The report is also available from the web sites of the Department of Civil Engineering. On behalf of the University Communications, a 60-second short movie has been produced covering a student project that is part of the course "Structural Health Monitoring", which is offered by the Chair of Computing in Civil Engineering since winter term 2013/2014. The clip is intended to show prospective students the interesting aspects of civil engineering. On February 5, 2014, the Chair of Computing in Civil Engineering has hosted the "2014 Smart Monitoring" student contest. Six interdisciplinary student groups of different degree programs have participated. The groups have implemented intelligent structural health monitoring systems, which have competed against each other in laboratory tests on a test structure. The intelligent monitoring systems have been designed to autonomously collect and analyze structural data using wireless sensor networks. The projects are part of the courses covering structural health monitoring that are newly offered by the Chair of Computing in Civil Engineering since winter term 2013/2014. The test structure has been provided by the Institute of Structural Mechanics (Dr. Zabel). The awards – book gift cards worth 175 EUR – have been bestowed on the winning teams on February 11, 2014. Visit the "Bautec 2014" trade fair: The Chair of Computing in Civil Engineering has organized a trip to the "Bautec 2014" (February 19, 2014, in Berlin), where the winning teams of the "Auf IT gebaut" competition will be honored. The bus transfer is free of charge. A few seats are still available. Please contact Prof. Smarsly or Dr. Kirschke if you would like to participate. Within the scope of the strategic partnership, Dr. Kirschke has held a course on "BIM Technologies and Computer-aided Design with Revit" at the Moscow State University of Civil Engineering (MGSU) from October 14 to October 27, 2013. Pictures from the Event. The annual German conference on computing in civil engineering - the "Forum Bauinformatik" - takes place in Munich. This year, the Chair of Computing in Civil Engineering are represented by Prof. Smarsly, Dr. Kirschke and Veronika Hartmann, who will present a paper on "Robust Construction Scheduling". Professor Dr. Kay Smarsly, appointed full professor at Bauhaus University Weimar, holds the Chair of Computing in Civil Engineering. Coverage in the Bauhaus Journal here (in German).